Amazon says it does not eavesdrop on customers' conversations to target advertising at them, after it emerged it had patented "voice-sniffing" tech. The patent describes listening to conversations and building a profile of customers' likes and dislikes. Reports speculated that Amazon would deploy the technology in its voice-activated Echo speakers. But Amazon said it did not listen to customers' conversations to target advertising at them. Launched in 2014, Amazon's Echo speakers can play music, set a timer or read the news when addressed with the wake word "Alexa". However, the patent describes an algorithm that can listen to entire conversations, using "trigger words", such as like and love, to build a profile of customers. The document states the system could then offer "targeted advertising and product recommendations". But Amazon said it did not use customers' voice recordings for targeted advertising. 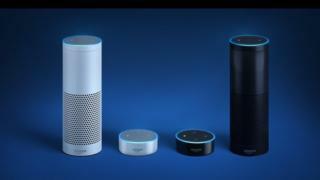 In a statement, it said: "We take privacy seriously and have built multiple layers of privacy into our Echo devices. "Like many companies, we file a number of forward-looking patent applications that explore the full possibilities of new technology. "Patents take multiple years to receive and do not necessarily reflect current developments to products and services." Facebook's chief executive, Mark Zuckerberg, has also denied that his firm listens to conversations in order to serve up targeted ads. Responding to a question from Senator Gary Peters during a US Congress hearing, Mr Zuckerberg said: "You're talking about this conspiracy theory that gets passed around that we listen to what's going on, on your microphone and use that for ads... we don't do that."